Rundum Meir offers the only UL approved Round-the-Corner garage door motor available in North America. But what does “round-the-corner” mean and why should you choose one for your home? Our Round-the-Corner garage doors slide horizontally to open and close. When they open, they wrap around the interior wall of your garage, rather than going up and overhead as standard garage doors do. There are several reasons to choose a Round-the-Corner garage door, some for practical purposes and others for design preference. 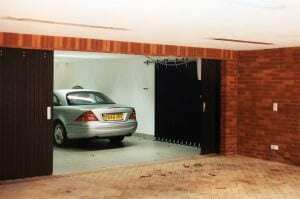 In some cases, architects choose a side sliding garage door because it is simply the best option for a unique design. For example, with a cantilevered garage design, a Round-the-Corner garage door is the most practical choice because it can wrap around the full garage opening, allowing full access from two sides when it is retracted. 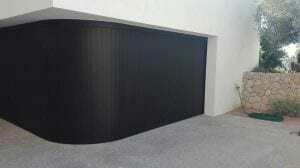 Rundum Meir custom garage doors can also be crafted for curved openings, arches, serpentine designs and more. A horizontal sliding garage door is also the perfect choice when you have limited ceiling height that won’t allow room for an overhead garage door. Our sliding garage doors also allow for easy partial opening, which means that you can achieve a door-within-a-door capability and use the garage as a pedestrian entrance. In some cases, architects recommend our Round-the-Corner garage doors for design reasons. Our doors designs for any architectural style, from classic to modern and everything in between. Each door is custom design to the needs of the project and handcraft from premium materials. Our Round-the-Corner garage doors can also build from insulation aluminum to allow for better climate control in the garage space. Rundum Original doors can create with manual operation or our unique automatic solution, which we create for ultimate user convenience and safety. The high performance, low maintenance door-mount garage door motor was engineering specifically for our automatic doors. It opens and closes in a smooth, quiet motion. Automatic doors come with a 2 channel remote control handset, homelink compatibility, the option for a separate push button inside the garage door, and a key activate lock. For more than 50 years, Rundum Meir helps architects and designers bring their visions to life, elevating garage doors from a practical entryway to a striking feature.